What MPT tunes are available for my F150 3.7L V6? 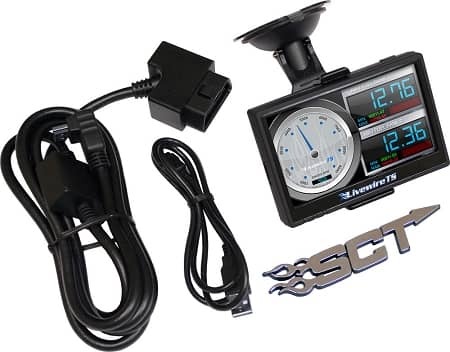 What can the SCT Livewire TS 5015P and MPT Tunes do for your Ford F-150 3.7L V6? *Recommended Option to Bundle with MPT Exclusive Tunes. The LWTS+ has the ability to hold 10 MPT tune files in addition to the pre-loaded files. MPT lets you take advantage of this feature by offering 3 or more MPT tunes created by our expert level SCT certified MPT tuners. These tunes are set up specifically for your vehicle and the modifications you have. Simply fill out the MPT Tune Form after purchasing your programmer and your personalized MPT tunes will be ready to go. 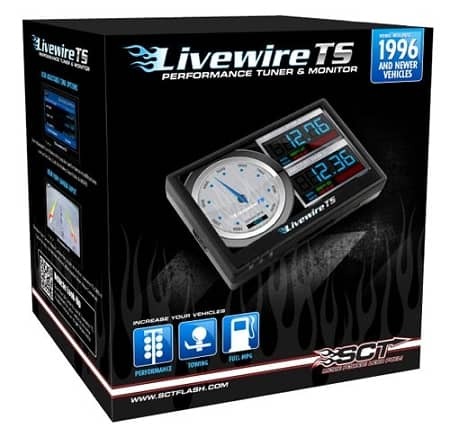 The SCT Livewire TS+ is PRE-LOADED with several DYNO Proven Tunes designed for many different vehicles. SCT's Dyno Proven Tunes are designed to increase Horsepower and Torque, as well as increase throttle response across the entire power-band. Make your car feel like the car you want it to be. What Vehicles are Supported and What Gains Can I Expect? 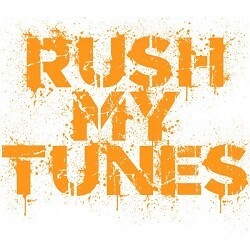 Click Here for a List of the SCT Pre-Loaded Tunes by Vehicle and Average Gains. If your vehicle is not listed you will need to use your MPT Tunes. Lucky for you, MPT provides 3. Please note that our Expert Level MPT Tunes will always beat the performance and satisfaction of the preloaded tunes. Most vehicles gain up to 10% in fuel economy while seeing the incredible increases in horsepower, torque and throttle response. Color LCD touch screen option to swipe or use directional navigation. Livewire TS+ case is easily mountable. Livewire TS+ is WiFi Capable. 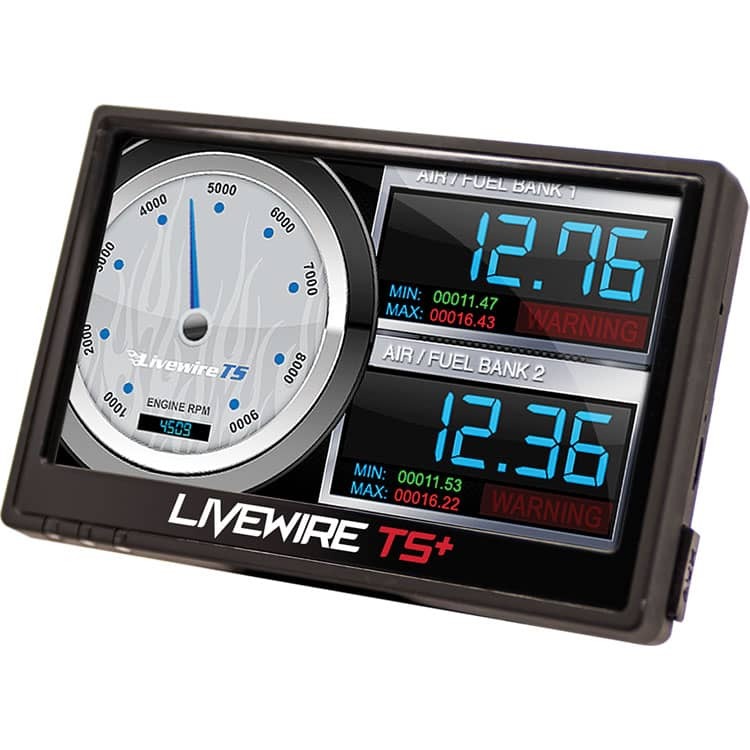 Use the Livewire TS Plus's On-Screen Data Logging to record engine parameters for later viewing on the device or on a laptop using SCT's Free Livelink Software. The LWTS+ also has the ability to be hooked directly to a laptop for Pass Through Data Logging of up to 20 parameters. A must have for the Do-It Yourself Tuner. Up to Eight total Analog Inputs to Monitor EGT / AFR & Other Popular Sensor Data. Allows you to connect external devices such as a wideband to read A/F, an EGT kit to read Exhaust Gas Temperatures, or a Map Sensor to read Boost. Once connected you can display these on the LWTS+ touchscreen using the On-Device Monitoring and/or Pass Through Data Logging. Tired of that pesky check engine light? Curious to see what it means and why it's there? The Livewire TS+ can help. The LWTS+ has the ability to Read and Clear OBD2 DTC Check Engine Lights. When the MPT tunes are being loaded onto the vehicle, there are options for the user. The list below reflects available options that the user has to tweak the tune beyond what MPT has already set. Adjustable options will over-write the MPT Tune. SCT Livewire TS+ 5015P Quick Start Guide is Available for Download, Click Here. SCT Livewire TS+ 5015P User Manual is Available for Download, Click Here. Optional Bundle of MPT Tunes created specifically for your F-150 by our SCT Certified MPT In-House Tuners. MPT has a combined 10 years of working at SCT here in Florida. Our time there was truly valuable to our shop and the way we run it today. We believe in Customer Service and Quality Tunes. Our reviews and feedback show our level of service. If for any reason you are not 100% happy with your purchase, please let us know.